What am I listening to, an unreleased Iconoclasta classic? A previously unknown Italian masterpiece? Darryl Way guesting with Quantum? None of the above. 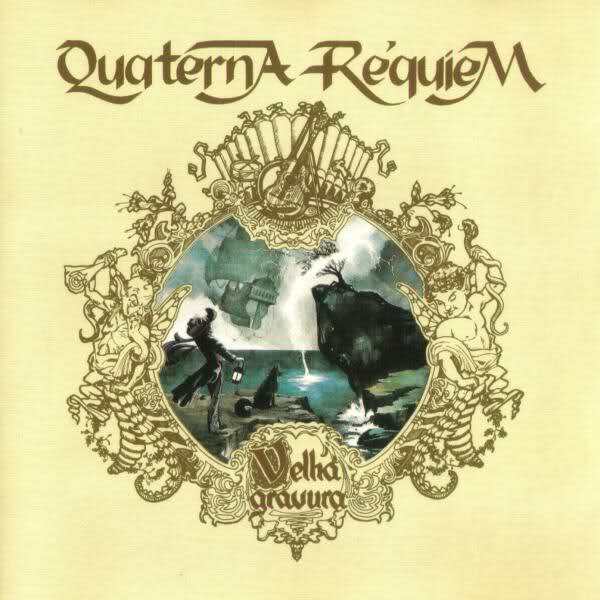 It is Velha Gravura from Quanterna Réquiem, a relatively new symphonic fusion band from Brazil. QR is a five piece band - Elisa Wiermann (piano and synthesizer), Kleber Vogel (violin), Jones Junior (guitar and viola), Marco Lauria (bass), and Claudio Dantas (drums and percussion) with a couple of guest musicians adding oboe and flute. The music is entirely instrumental and ranges from the stately and emotional "Madrugada" to the festive title track "Velha Gravura," What makes Quaterna Réquiem a notch above other similar bands such as Dogma is their ability to blend in the classic instruments like the violin and flute with the synthesizer and come up with something that is not too dated nor too modern. This release is highly recommended to fans of symphonic fusion or to those who are saddened by the fact that bands such as Quantum and Gotic only managed to put out a single release. Let's hope that Quaterna Réquiem does not follow down the same path.